The United States sent another destroyer with Tomogawks on board to the shores of Russia. This time to the Baltic Sea. Earlier, the American missile destroyer “Donald Cook” (USS Donald Cook (DDG 75) entered the Black Sea. “MK” asked the expert how to evaluate these actions of the US Navy. Observers reported that the USS Gravely missile destroyer (USS Gravely (DDG-107) entered the Baltic Sea. The destroyer is not weakly armed: up to 56 Tomahawk cruise missiles with a range of 1.6 thousand km and anti-missiles complex ” Aegis. ”At the same time, the destroyer Donald Cook is looking for something in the Black Sea. What goals can these“ cruises “pursue? How dangerous are they for Russia?” MK asked the chairman of the presidium of the All-Russian organization “Officers of Russia”, the Hero to answer these questions. Of Russia, Major-General Sergey Lipovoy. -What are the threats of the presence of American ships near our borders? -No. These are intelligence and demonstration activities. Moreover, the time spent by NATO ships in the waters of the Black and Baltic Seas is strictly regulated by international agreements. Plus, the guard ships of the Russian Navy constantly accompany them. Not to mention the “Ball” and “Bastion” coastal missile systems in the Kaliningrad region and in the Crimea, which are capable of destroying any surface targets, in case of violation of our territorial waters. – Can US ships connect to Ukrainian provocations in the Kerch Strait? – From my point of view, no. In the US, they are well aware that the Black and Baltic Seas are the water area controlled by our country. In recent years, a major breakthrough has been made in ensuring our security in these waters, especially in the field of radio electronics. Therefore, any provocation will be fraught with, above all, for the United States. 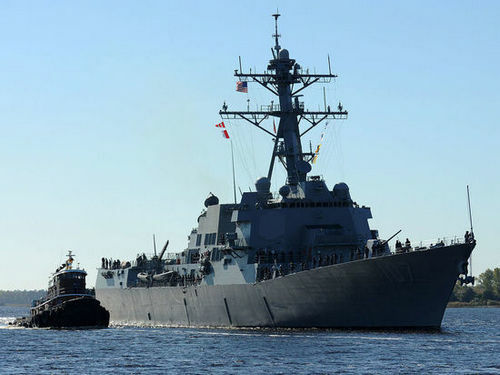 -American destroyer in the Black Sea can be used for the emergency evacuation of Petro Poroshenko, if the presidential elections in Ukraine will lead to unrest threatening his security and provocations? – It is extremely unlikely that Poroshenko will need evacuation. In addition, it is much faster and safer to do it by plane, and not be under the constant aim of Russian missiles in the Black Sea. Earlier it was reported that “Donald Cook” went to the port of Odessa, where on its board was visited by the President of Ukraine Petro Poroshenko. In turn, the official representative of the Baltic Fleet, Captain 1st Rank Roman Martov, told the MK that the fleet rocket engineers conducted a training session on the destruction of naval targets using the Bastion mobile coastal missile systems. The calculations of the “Bastion” missile systems have completed the advancement of technology to the desired area, reconnaissance, target designation, and executed electronic missile launches.